Save time. Get reimbursed. Mobile charge capture. If you’re still using paper to document patient encounters and record diagnosis codes, you’re losing time and money. 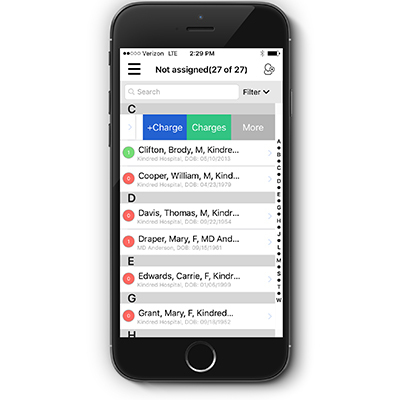 PerfectServe’s mobile charge capture puts the power to maximize your reimbursement right at your fingertips. 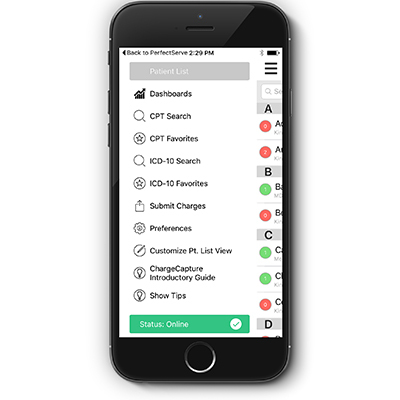 Finish your appointment or make your rounds and use PerfectServe’s mobile charge capture module to enter accurate CPT and ICD-10-CM codes in just a few taps, wherever you are, even if you don’t have cellular or Wi-Fi access. Sync your device as many or as few times a day as you’d like and your entries go straight to your billing team. Fewer missed charges, fewer reimbursement denials, more correct charges going directly to your billing team, flexible web-based reports that let you monitor your activities, and integration with practice management applications or ADT. PerfectServe’s charge capture makes it easier for your practice to bill and receive reimbursements quickly and correctly. Bottom line? You'll realize more revenue and save time. With MACRA and MIPS compliance initiatives on the horizon and value-based healthcare on everyone’s minds, it’s more important than ever to run your practice efficiently and effectively. Use our infographic to learn how PerfectServe mobile charge capture can help with revenue cycle management, compliance and much more.